Best Pistol Range Bag: What Are Your Options? Shooting is a sport and hobby enjoyed by many. If you’re one of those who is into this sport and hobby, then you’ll notice that as you get more and more attached to the activity, you also start acquiring more gears and accessories. 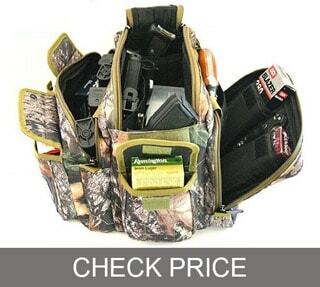 That said, it is crucial to invest in the best pistol range bag that will ensure that there is a proper and protected storage area for all the items that you need. With the aid of your pistol range bag, you can secure all your gears and accessories, including spotting scope, rangefinders, scopes, binoculars, gun cleaning kits, and more. Here are five of the most popular pistol range bags at present so that you will have proper guidance during the selection process. 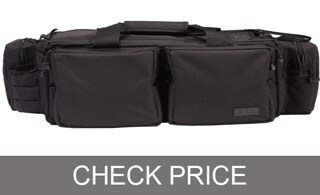 5:11 tactical range bag has most of the things that you need for a range bag. Mainly made of 600D polyester fabric, the bag is not only high in quality but is also durable. It comes at a size, which makes it effortless to use. At the first touch, you will immediately notice its nice and quality feel. Almost all pockets integrated into the bag have sufficient amounts of padding, so there is no need to worry about your items getting damaged if accidentally falls off the ground. Regarding flaws, one thing to point out is its price. It comes at a cost, which is higher than those of similar style, category, and features. Another issue is that it is too large that you will most likely overload it without you noticing. Such will cause the bag to become too heavy unexpectedly. It does not also come with padded removable pistol rugs that could have been a beneficial feature. 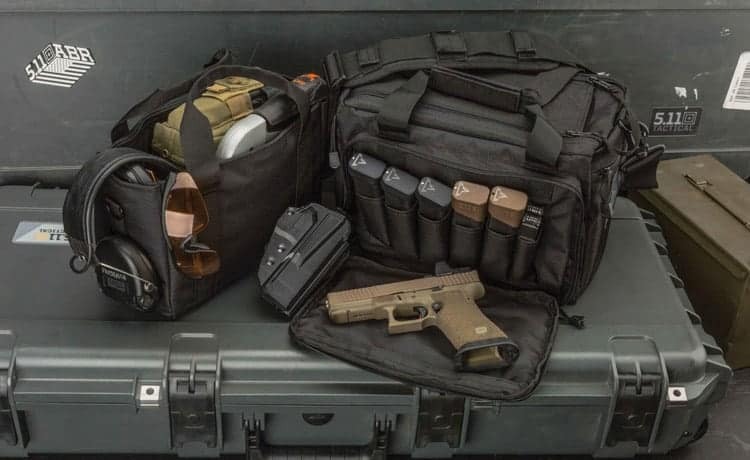 5.11 tactical range bag is still a satisfactory option for anyone wishing to keep all their hunting and shooting gears and accessories organized. It has a main compartment, which measures around 9”x18”x10”. Furthermore, you will notice a removable ammo tote integrated inside. Another feature is the brass pouch, designed to keep you out there. You will also fall in love with the fact that this bag has multiple pockets, catering to the needs of those who want to have some of these. It features five outer pockets plus one special pocket designed to hold one water bottle. There are also eight pockets specially made for your pistol magazines. G.P.S. 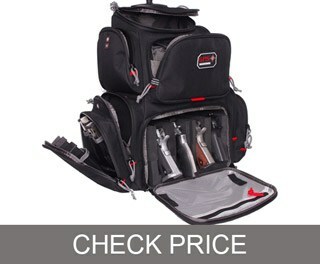 Handgunner Backpack is also one of those items that can meet all your requirements for a pistol range bag. One of the features you’ll notice in this backpack right away is the storage cradle, which can securely handle around four small to medium handguns vertically. It gives you the opportunity to transport your ammo and handguns, as well as your other shooting equipment comfortably and safely. This bag is not perfect, though, as it also has its set of flaws. One is the fact that it is quite heavy. It does not also feature inserts supposed to be designed to store small items. Another problem is that it is a big expensive. The flaws of the product don’t necessarily mean that it is not a good buy, though. In fact, there are many things that you will find enjoyable from it. For one, it has a sturdy fabric and zippers. Despite being thin, the inner pockets and lining don’t seem like they will easily snag or tear. The cradle featured in the bag is constructed out of dense foam. It has a flawless design, which is anything but flimsy. Aside from all that, it is tough enough to withstand wear and abrasion often caused by the ammunition, guns and other items you bring with you on your outdoor adventures. Furthermore, it has a waterproof raincoat or rain cover, which you can find at the uppermost part of the zipper pouch. Such feature is beneficial during sudden poor weather conditions. The cover can help ensure that the bag, as well as its contents, stay dry. G.P.S. 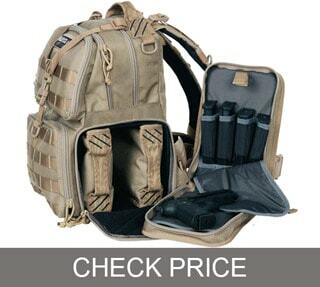 Tactical Range Backpack boasts of its three inner handgun storage cases. It also comes with magazine storage, making it a worthy investment if you’re in search of a bag, which will serve as your best buddy during your outdoor shooting adventures. It has a large main compartment, allowing it to handle huge amounts of ammo. Also integrated into the bag is a divider, which you can use when you want to split things up. Two entrance pockets that are enough to store additional miscellaneous items, like pens, phone, EDC gears, and flashlight are also available. Just like other pistol range bags, G.P.S. Tactical Range Backpack also has some drawbacks. One is that fact that it is quite bulky, which might affect your overall experience when you’re using it. The shoulder straps also need more padding as these tend to hurt one’s shoulder when carrying around forty to fifty pounds of weight. Lastly, it does not come cheap. Still, its features and benefits are worth looking into as it makes it one of the most valued pistol range bags you can find. Made of sturdy nylon treated with DuPont Teflon, you have an assurance that it will last long. You will also find its padded midsection strap useful, as it aids in stabilizing the weight of all the items stored in it. It has plenty of room, making it easier for you to store all your stuff in there – holsters, safety gloves, ear defense, new mag pouch, ammunition, etc. Made of 600-denier polyester, this 18-inch and range-ready bag is long-lasting while having the ability to handle whatever weight you put into it. At the front compartment, you will find around seven magazine pouches. The rear compartment, on the other hand, features four magazine pouches. This number is enough to provide you with adequate space for all your things. There is a problem in this bag’s shoulder strap, though. It is because it is not removable and is incapable of swiveling, which is a disadvantage because in those instances when the bag is fully loaded, you won’t have the option to replace the strap to make it sturdier. The divider system also needs a bit more improvement while the magazine sleeves are not that universal – they are quite deep. Despite the mentioned, the versatility and quality of the bag are still unquestionable. It has additional features like the removable or adjustable inner partitions that can help you customize the main compartment based on your preference. Furthermore, it is versatile and functional enough that it can handle all types of activities. 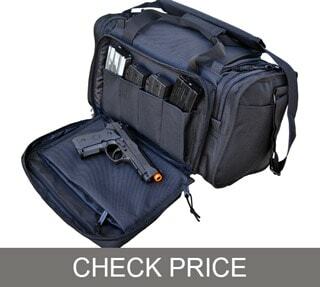 This is one of the best pistol range bags that you can find since it provides real value for your money. You can carry it along with the messenger bag strap or the carry handles attached to it. Available in its mossy oak with pink trim design, this item will serve as your go-to bag for all your shooting and hunting adventures. What you’ll love even more about it is the fact that it has a padded handle plus adjustable shoulder strap. While this padded gun bag from Explorer is a beneficial option, it is still crucial to take note of some of its flaws. One problem is that it has a weirdly added Velcro patch on one of its sides. You can’t see this in the pictures shown online. Many also wished it to be a bit larger, so it can comfortably carry several weapons. Still, it is a good bag, which is suitable for all gun lovers out there. The fact that it stylish and well-designed is also a bonus, as it makes it more fun to wear and use. Some still wished that it would be larger. You can’t just pick any pistol range bag that you can find on the market. Check the durability of the zippers used in the bag. Note that some range bags have weak zippers, causing them to be irreparable once they break. Choose bags with heavy-duty and strong zippers so that you can rely on them for a long time. Note that you will be using the range bag to organize and store some items. That said, you need one made of sturdy materials – preferably with at least 400-D nylon or 600-D polyester. Check the quality of the stitched seams, as well. Make sure that the specific areas in the bag that will most likely receive the heaviest loads and stress have reinforced stitches to keep them intact. Whether you are picking a small and plain bag or a large and spacious one, you need to ensure that it is comfortable enough with padded straps. Before buying, try it out. Add some weight, so you’ll know exactly how comfy it is once it rests on your shoulders. Decide whether you wish to own a bag, which you can just wear or carry around. Most range bags at present are possible to carry either over one of your shoulders or by hand. Find out which is one is more comfortable for you before making a decision. Check the design thoroughly. Find out if it comes with the main compartment and some padded pockets, or if its design is more on like a regular daily bag. If possible, go for one with a padded compartment, as this helps protect all your gears and accessories. Of course, you need to go for a durable bag. It should be sturdy enough that it can serve you for a long time. Set a budget first before you start looking for a list of range bags. Narrow down your option and ensure that they perfectly suit your set budget. Make sure, however, that your choice still has all the features that you need despite sticking to your budget. The best pistol range bag is that which contains pockets of various sizes. Keep in mind that you’ll be storing a lot of items there, so having one with several pockets that are easy to access and use is beneficial. When deciding which one is the best pistol range bag for you, spend time looking at your specific preferences and needs. Whether you choose a subtle or professional bag, it is important for it to be sturdy enough. It should have an excellent built plus organizational options without sacrificing your comfort level.